They say good things happen in threes, don't they? Well, a Liberty Slots Casino player had quite a winning streak recently -- three years to the day since she started playing there! “Karen” had been enjoying some of her favorite slot games and some video poker. Her winning streak really started when she won $10,000 in the bonus game in the Fat Cat slot game. She took her mushrooming bank-roll and, somehow feeling that this was going to be her lucky day, and started playing the Lucky Lady slot game. A $41,000 spin on Lucky Lady slot at Liberty Slots part of player's $80,000 winning streak. 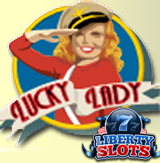 Lucky Lady is a 25 payline WW2-themed slot game from Wager Gaming Technology with bets from a penny per spin up to $10 per line. It has a bonus round where players select from five Fighter Planes to reveal prizes of up to 100X the triggering bet. Initially betting $150 per spin, Karen hit the bonus game in less than two minutes and was quickly up $16,000. She triggered the bonus game again right after increasing her bet to $175. This time she won $41,000. “I know I've been playing here for a long time,” said Karen, “Although I didn't realize it was exactly three years until I got the call from the host this morning congratulating me on my good fortune! I think I may owe my neighbors an apology -- there was some excited screaming in the house today!" Liberty Slots is known around the world for its unique collection of slots and other casino games and for all the slots tournaments it hosts.